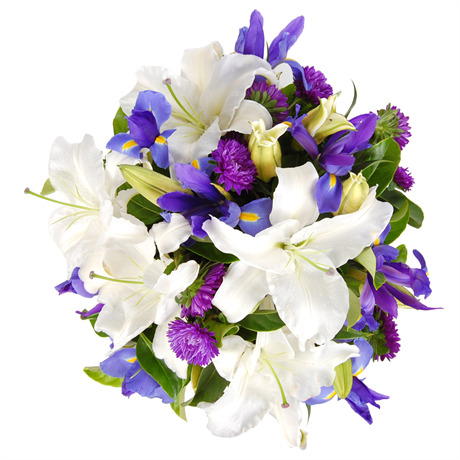 This elegant and refined box arrangement is a vision of creamy white offset by velvet purple and cobalt blue. A fan favourite, the Billie arrangement features Aster daisies, Oriental lilies, and indigo irises creatively nestled in a gift box and accented by fresh foliage. This splash of rich colour would make an imaginative romantic gift, a graceful sympathy offering, a delightful ‘thank you’ present, or even a superb table centrepiece.